Some books are meant to be only fully understood by certain groups of people, and I certainly feel as if this is the case for the book. I had only really heard of the term ‘Introvert’ about a year or two ago when I took a Briggs -Meyer test for one of my Internships, and was surprised when I read my test results; it sounded exactly like me. 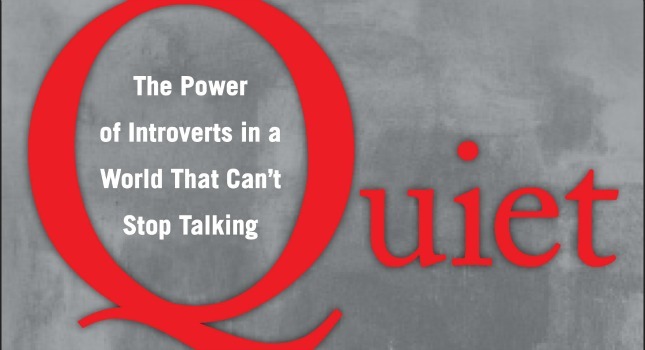 It’s very easy for introverts to feel out of place in an American society that consistently preaches extroversion and an over-the-top outgoing nature. I certainly did. It felt as if the group project in school was one of the dreaded things in my life, and still is to this day. I thought it was weird that I liked taking long walks at night and listening to Beethoven or a Sonata, and bask in quietness and silence. This book revealed something to me; it isn’t weird. It’s you. Susan Cain touches on the societal biases against introverts in a way that truly hits home for me. I love the occasional party or two, but I can only stand a couple of hours of the pointless small talk and noise. For the first time in my life, I realized that there were others who at last could relate in this sense. I could read Susan’s words and relate to the societal barriers and stereotypes that she had encountered, and for that reason this book is one of the most ‘human’ of the literary works that I’ve read in a long time. It avoids bashing upon extroverts, wish I’m very thankful for. She never reduced extroverted-people to somehow below introverts in any sense, which reaffirmed the main point of the book; we’re all different, and our differences make us unique in a good way. Society needs the social butterfly and comedian as much as it needs the inward-looking writer or scientist. We all have our part to play. I would highly recommend this book to anyone who fits the characteristics of the common introvert, or anyone who wants to learn more about the introverted people around them. This book certainly has the potential to be a revolutionary work of literature in the field of human personality types and psychology, and I can’t wait to see a similar well-balanced and well-written book to be written about extroversion. It’s very easy to hope that you’re something else than what you currently are, but this book makes me very happy to be who I am today. And for all of the introverts out there who have felt a victim to society’s stereotypes of the inward-looking individual, this book can help you look at yourself in a non-critical way. I highly recommend it to everyone who likes a good book. All the kudos in the world to Susan Cain on this great book.